Living on campus is a wonderful opportunity for students to take advantage of all that the University has to offer. Living on campus is a chance to live and interact with culturally diverse students as well as receive support and enhance learning opportunities through live-in faculty and Student Affairs staff. 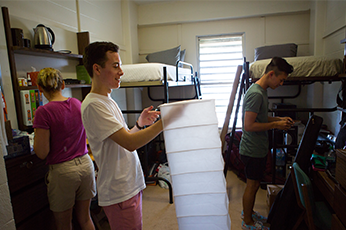 While the University has five residential colleges and the University Village, all non-local freshmen students are required to live in University housing for two academic semesters. To help support our students, all of our residential colleges promote and enhance student learning and success through various programs, seminars, and activities including sports competitions, movies, and ice cream socials. With hundreds of programs scheduled during the academic year in the residential colleges, students can choose from a range of academic and cultural events along with other fun activities—literally in their own backyard!